Gpedit.msc is a name of a Windows module or a tool that is used to administer or modify group policies. See the Group policy (Windows) page for more details. Gpedit.msc is a file name for the Group Policy Editor console. The Group Policy Editor console is mostly a graphical user interface for editing registry entries. Editing registry entries manually is not very easy because they are located at many places throughout computer registry. The gpedit.msc tool makes the administration of registry easier. Your SystemRoot is most likely C:\Windows or C:\WinNT. Policies that apply to the computer are stored in a sub-folder named Machine and policies that apply to users are stored in a sub-folder called User. The file that holds your settings is named Registry.pol in both cases. See the How to edit group policy page for more details about how to edit group policies. 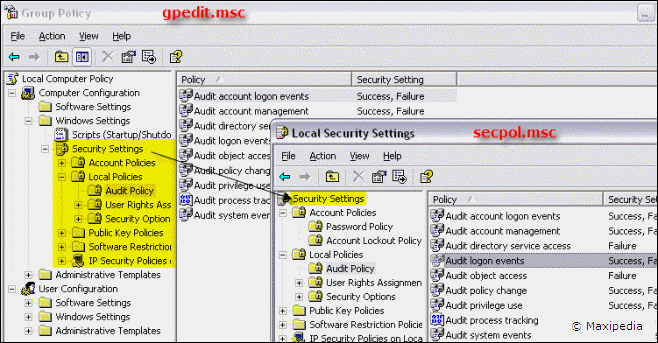 Secpol.msc is another Windows module that is also used for administration of system settings. Secpol.msc or Local Security Policy Editor in layman's terms is a smaller brother to the Group Policy Editor. The secpol.msc is used to administer a subgroup of what you can administer using the gpedit.msc. You can see that when opening the Group Policy Editor gpedit.msc, you get to see more than when opening the Local Security Policy Editor secpol.msc, and that is the major difference. The gpedit.msc is broader. The secpol.msc is narrower and focuses more on security related registry entries. Gpedit and secpol in Windows XP/Vista HOME Edition? Neither GPEDIT.MSC or SECPOL.MSC is available in Windows XP Home Edition or Windows Vista Home Edition or Windows Vista Home Premium Edition. This is because these versions of Windows cannot join a domain by design. You think this is really bad, right. Both the Group Policy Editor and Security Policy Editor were designed to be used in an enterprise environment running Active Directory. These tools are just easier ways to making registry entries. Most settings that can be set using secpol.msc, gpedit.msc, and other tools are just plain registry settings. So, if you are missing gpedit.msc and secpol.msc on your computer, you can always edit the registry using the Regedit tool. Registry keys related to policies are spread out throughout many places in registry. This is another place where many policies can be found. However, know that editing the registry incorrectly can make your system unstable or even unable to start. Proceed carefully when updating registry. Something is still not clear? In that case, ask us in our discussion forum. The following articles can help your with your gpedit ideas.